Today the Court stood by a principle in this nation that we do not tolerate laws that disadvantage people because of who they are. 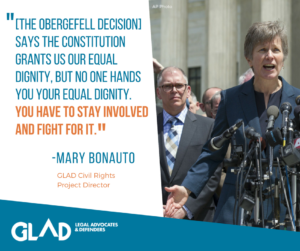 Two years ago, GLAD Civil Rights Project Director Mary Bonauto spoke these historic words in celebration of the Supreme Court’s landmark marriage equality ruling in Obergefell v. Hodges. It was a momentous day for love and for justice, affirming the equal dignity of LGBT people and inspiring joy for couples and families across the nation. For Mary, and for GLAD, it was also the culmination of a two decade-long fight to advance equality – a fight your support helped us win. But even as our community celebrated an incredible victory that day, we knew the fight for justice wasn’t over. With your support, GLAD will keep fighting across the country not only to resist any effort to push back against marriage equality, but to ensure that those principles of dignity, equality, and justice articulated in Obergefell are extended to apply to every member of our LGBTQ community. We were a leader in the movement for marriage equality from the beginning. With your ongoing commitment, we will continue our groundbreaking work for justice for all.